This is a direct appeal for a regressive hypnotherapist able to unlock - UNLOCK! - deeply buried memories. The time was the droughty summer of 1976. The place was Finchley Reform Synagogue, where a fellow student in rabbi Jeffrey Newman's bar mitzvah class was a little chap who grew up to be the speaker of the House of Commons. 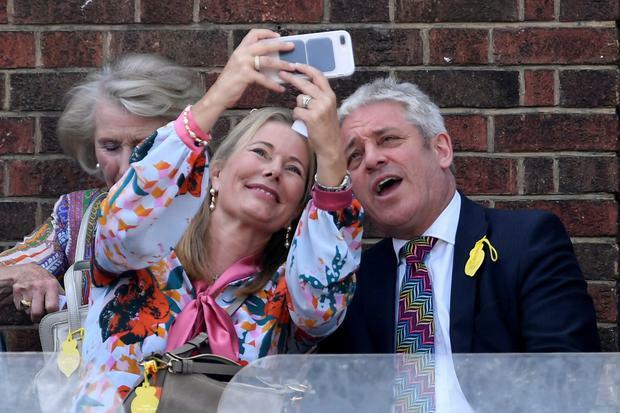 After his intervention, I'm more desperate than ever to take vicarious glory from the incredibly close friendship with John Bercow, which the passage of decades has sadly occluded. Was he Spurs or Arsenal, or too besotted with tennis to be either? Was his tendency even then towards the endearingly pompous? Did we share visits to a newsagent, en route to the bus stop, to glance tremulously at the top shelf? Was there a hint in his unbroken voice of the booming baritone to which the YouTube classes, here and across the globe, have become so addicted? Nada. But you needn't have personal knowledge of the boy to know the man. No one with half a functioning brain, if that, could be shocked by his ruling that Theresa May cannot keep bringing her deal to the Commons ad infinitum and nauseam. This was so predictable that even I, the least reliable predictor available to humanity, predicted it back in January. "It will also be his decision, if and when May's deal gets the clobbering it deserves, whether she can nip back to Brussels and ask the Commons to vote on an eerily similar deal with cosmetic differences," I wrote then. "If he decides that the specific cosmetic is the lipstick she's putting on a pig, and enforces the rule that the Commons can't be asked 'substantially the same' question more than once within a session, that's that. Her deal is dead, and she can run down the clock no longer." I was predictably wrong in various ways. He did give her the second chance that ended with the 149-vote defeat. He did let her run down the clock for longer, until every tick moonlights as a powerful laxative. But could anyone remotely familiar with Bercow have doubted that, with a gargantuan place in British (and European) history beckoning, he'd indulge her lunatic intransigence and ostrich-like self- delusion indefinitely? Yes, they could. The Downing Street duncetariat was staggered by the inevitable. The budgie perched on Churchill's shoulder as he lay in bed after his stroke (the one Anthony Eden reported nipping down now and then for sips of his whisky) would have seen this coming, and prepared. Yet neither May nor anyone in her bunker had an inkling. We have been led to the edge of oblivion by the central committee of the Benny From 'Crossroads' Praesidium. Even when they talk comparative sense, they find forms of words that mandate an instant sectioning under 14 (b) iv - the so-called Certifiable Lack Of Self-Awareness clause - of the Mental Health Act. "No 10 reject the idea that Mr Bercow's ruling increases the likelihood of no deal," the 8pm bulletin on Radio 4 related. "They insist that even were parliament to vote down moves to delay Brexit, it would not override any agreement reached between the British government and the EU." So that's the type of parliamentary sovereignty they've been fighting to reclaim from Brussels, is it? The type that's trumped by backroom deals in Brussels. Brextremists see it differently, of course, calculating that Bercow has shortened the no-deal odds. If they're right about that, Liam Fox offers timely reassurance that it won't be as economically ruinous as feared. He tweeted his Section 14 (b) iv application. Dr F has not only "initialled" one of those easiest trade deals of all time, with the economic goliaths of Iceland and Norway. "This is on top of the agreement we've signed," he proudly added, "with Liechtenstein." Don't laugh. Liechtenstein is the planet's leading manufacturer of false teeth. You can't overstate the value of tariff-free dentures if any no-deal privations extend to toothpaste and fluoride to put in the water. In the land of political dwarves, the 5ft 5in Bercow is a colossus. Obviously, the reaction to his decisions is shaped by which side you support. What looks a stonewall penalty to one set of fans looks a blatant dive to the other. And it would be disingenuous to dispute that the ref with the B******s To Brexit car sticker is wholly impartial. But beneath those parti pris perceptions, there's no denying his ferocious dedication to countering the unspeakable arrogance of the executive, and commitment to limiting the damage threatened by its surreal incompetence. Until now, his catchphrase has been the most savagely ironic ever. Every stentorian utterance of "Order, order... Unlock!" has brought a sardonic smile in the face of such utter chaos and gridlock. But now we know for certain that if anyone has the force of will to create order from anarchy, and the Houdini-like skills to undo the suffocating chains, it's my beloved old bestie from Rabbi Newman's class. I must have been at his bar mitzvah, though without the hypnotherapy I can't recall which Old Testament book his portion of the Torah was taken from.